How complicated is it ? Welcome back. Now, lets talk about YOUR project. Question 1: What kind of re modeler are you ? Broadly, there are two types. Question 2: What is the scope of your project ? Question 3: Are there modifications to your existing space required to implement the new elements? Once the budget and scope are determined, we need to understand how the existing conditions within the remodel space can accept the changes. The full extent of these conditions are often unknown until the demolition phase. All new work must comply with the building codes. The most common issues in the bathroom relate to compliance with plumbing codes. Pipes need to be the right diameter. Systems need to be vented properly. Old houses have old pipes that often need to be replaced. The next most common issue is the floor framing in old houses. Back-in-the-day, the pragmatic approach of notching a joist mid-span, or drilling a large hole near the ends of joist were common practice. These things need to be addressed in order to assure the structural integrity of the new work, and so the tiles won’t crack. There are also electrical codes that need to be considered, although remedies to those issues are often less involved. 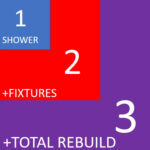 As you can see from the picture, we typically start with the shower, then you may want a new vanity or a toilet (+FIXTURES), or you may want to demo the whole thing, move a wall, move the fixture locations, etc (+TOTAL REBUILD). Bigger projects cost more and take more time. Smaller projects take less time and costs less. You knew that. 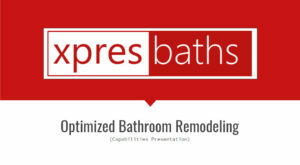 It would be ridiculous to speculate what your project would cost if you are in any category other than #1 SHOWER. So, think about what you want without really making the jump to budget just yet. If you want something, we can tell you what it costs, then you can decide if you still want it. Review >>> The major drivers for your project are Budget, Project Scope, and Existing Conditions. If you say “I have $7,000 and I want to replace the current plastic box I shower in with a beautiful new tile shower, can you do that ?” you are a Budget-Priority re-modeler with a well bounded scope(#1 SHOWER ONLY) and the existing conditions are adequate to accept the remodel. SCOPE>> Leave the existing shower valve. Connect the new drain body to the existing (up to code) plumbing. Rip the plastic box out, augment/true the framing, install a shower pan, waterproof the whole show, install tile (Home depot or Lowes lowest cost) , grout, shower curtain, done. We only need a plumbing permit for this one. No problem, you could be showering in under a week. In fact, we may already have all 90% of it done and ready for installation. No kidding. can make this happen faster than anyone. In all other cases, the features and scope expand beyond the first case. What your project needs at this point is process resulting in clear product choices, precise configuration, and actionable tasks for you, us, the carpenter, the plumber, the electrician, the plasterer, the glass vendor, and any else who we need to achieve the scope. First step is to model the result. There are 4 pages of information we need to start. SCOPE, FLOOR PLAN, DOLLHOUSE (view),and PROCUREMENT. Here is a sample template we use: pdf_v5.2_Sample 4 page presentation . The process we use can produce detailed elevations, cross sections, and alternative views. We use this to model the choices you are considering to elevate your confidence in the selections, provide clear direction to all parties, and show you your new vision. can make this happen faster, and better than anyone. At this point, you should have a good sense that we really know how to orient you to the domain of bathroom remodeling, help you form your vision for your new space, and execute flawless on a well formed plan. We have great relationships with vendors who can get pretty close to or even beat Amazon pricing on fixtures. We will find the optimal path in support of your vision. For this reason, we believe…..
can make this happen faster, better, and cheaper than anyone.